NACOGDOCHES, Texas - Anticipation builds as the stage lights dim. Backstage, actors shake out their nerves, take a deep breath and move to their opening spots. A hush falls over the audience. It's show time. Stephen F. Austin State University alumnus and Crandall High School theatre teacher and director Daniel Gambill blends into the crowd at Round Rock ISD's Performing Arts Center as he takes his seat. It is the second time a One-Act Play he has directed has made it to the University Interscholastic League's state competition. For now, his work is done. All he can do is sit back, try to relax and enjoy the show. Hours after his students' performance of "The Book of Everything," Gambill and the cast and crew anxiously await the awards presentation. Tension builds as the third- and second-place winners are announced. Screams and applause suddenly erupt as Crandall High School is named the 4-A Conference One-Act Play champions. "For years I have dreamed about what that moment would feel like, but I really can't describe it," Gambill said. "I looked at my students and they were all crying, clapping and hugging. It was magical. I'll never forget what they looked like as they reveled in our success." Gambill remembers being in a state of disbelief when accepting the championship trophy. "When I walked across the stage to the contest director to shake his hand, I verified with him that he had actually called our name," Gambill laughed. "I walked to Luis Muñoz, the UIL director of theatre, who asked me if I was OK, and I said something like, 'I don't know, but I think so.' He then handed me the trophy and said, 'Welcome to the club.'" As a high school theatre teacher and state champion, life has gone full circle for Gambill, who as a high school student was heavily involved in UIL academics and One-Act play. Gambill always knew he wanted to be a teacher but said he didn't realize he wanted to teach theatre until high school. He credits his involvement in UIL and theatre with leading him to his calling. "This is my dream job," Gambill said. "I love building relationships with my students. So often there are children who don't hear any positive words at home, and it is a goal of mine to be the positivity they need." A third-generation Lumberjack, Gambill attended SFA to study secondary education and received his Bachelor of Arts in theatre education in 2010. Even though he is a direct descendant of Sam Houston, Gambill said attending SFA is somewhat of a family legacy. "Our family has deep roots in Nacogdoches," he said. "I went to SFA because it already felt like home when I stepped on campus." 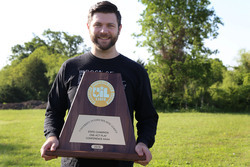 Since graduating, Gambill has brought his knowledge and love of theatre to Pine Tree ISD and later to Crandall ISD, where he has taught for the past seven years. "The College of Education prepared me for teaching so well. I refer to my notes in my textbooks for solutions to problems on a weekly basis," Gambill said. While he admits thousands of moments from college stick with him, one particular moment that changed him was when Dr. Kenneth Austin, professor in SFA's Department of Secondary Education and Educational Leadership, taught Plato's "The Allegory of the Cave." "This essentially explains what happens when a student's mind opens up to the possibilities of learning," Gambill said. "I believe Dr. Austin's teaching of this story truly made me a better teacher and human." During his teaching career, Gambill has directed more than 30 plays, including dramas and musicals. Much like this year's one-act, Gambill said the cast and crew had their fair share of obstacles to overcome, like rehearsing in a cafetorium that was under construction. "We persisted, and we persevered. Watching our performance at state was very emotional for me," Gambill said. "The weight of all the hours of work, struggles, triumphs and the power of the play itself caused a very visceral reaction. I am completely overwhelmed by all of the emotions and thoughts. I'm truly blessed."